It’s been really difficult to tell which teams will come out week to week, but I think it’s a lock that Sean McVay is the coach of the year. 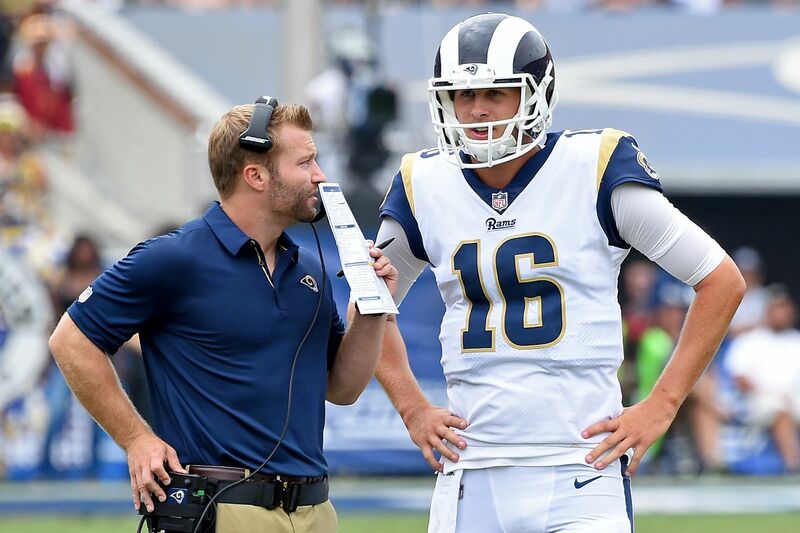 I’m an avid Jay Gruden fan, but one has to wonder whether the Redskins should have pulled a Tampa Bay and replaced Gruden with McVay… but maybe Jared Goff is more suited to McVay’s offense than Kirk Cousins is?! Tennessee Titans at Pittsburgh Steelers (-7) — The Steelers often play to the level of the competition so I expect Ben Roethlisberger and crew to come out and put on a big one. Juju Smith-Schuster should be getting more consideration for rookie of the year. He has been the best rookie wide receiver. Detroit Lions at Chicago Bears (+3) — Mitch Trubisky isn’t that bad, but the Bears aren’t a team that can compete every week. I’m just hoping that this team falls on their face to end the season so that the John Fox coaching era in the NFL officially comes to an end. He’s not the right coach for the Bears going forward. Jacksonville Jaguars at Cleveland Browns (+7.5) — I don’t know if the Browns go winless, but they are one of the worst teams I’ve ever seen. On the other hand, the Jaguars are much more talented, but maybe one of the dumbest teams in the league. There is nothing worth betting on in this game. Baltimore Ravens at Green Bay Packers (+2.5) — This is a weird game to pick, but I’m not completely done with Brett Hundley yet. We’ll see if Mike McCarthy fashions the offense around the former UCLA star’s talent. On the other hand, what about Joe Flacco to the Jaguars in the offseason? Tampa Bay Buccaneers at Miami Dolphins (-3) — Ugh. Why? I’m just glad the Dolphins are off the national television schedule – but this game is just awful. Los Angeles Rams at Minnesota Vikings (-1.5) — Case Keenum had the best game of his career last week and he’s going to come back to earth this week. As for Jared Goff, he’s a damn good player. Washington Redskins at New Orleans Saints (-7.5) — It’s the Redskins. With their backs against the wall. We’ve seen this story before. Kansas City Chiefs at New York Giants (+11.5) — How Ben McAdoo still has a job is mind blowing – his players are in full revolt, the entire team has no idea what they are doing, and Eli Manning may die before his career ends behind that awful offensive line. Please save Eli. He is a Manning after all. Arizona Cardinals at Houston Texans (+1.5) — The NFL owners should collude to keep Tom Savage out of the NFL. Buffalo Bills at Los Angeles Chargers (-4) — In the Anthony Lynn-bowl, both teams are going to battle to a 30-30 tie. Before the Chargers do something stupid and lose. Cincinnati Bengals at Denver Broncos (-3) — Is John Elway going to suit up at quarterback for the Broncos? Because that’s the only way the Broncos score enough points. Although, that being said, the Bengals’ offensive line has been a sieve this whole season since their young guys haven’t really developed, so this is another dandy of a game. Just bad games all around this week. New England Patriots at Oakland Raiders (+5.5) — Why is this line so low? I’m expecting a double-digit win for Martellus Bennett and the Patriots. Atlanta Falcons at Seattle Seahawks (-3) — Without Richard Sherman, the Seahawks’ defense is just above average. I expect Atlanta to get back into the playoff picture here .